whereby the tank is located on the ground and the collectors are located on the roof. aesthetics of a split system. government incentives ensure these costs are more than paid back over the life of the unit. the suns energy to heat water. 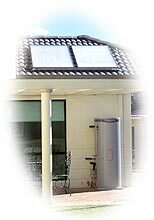 Solar water heaters are available in a range of tank capacities and tank mounting positions. The larger the tank, the more solar heated water that can be stored. Remember to consider both the space you have available for installation and your budget. Solar collector(s) are located on the roof structure, facing in a north east to north west direction. The sun heats the water in the collector and then goes into a tank - in the case of flat plate systems, this may also be on the roof, but with evacuated tube collectors, the tank is usually stored at ground level. The hot water rises naturally in the tank - this process is called thermo siphoning. This water is then made available to the house, either through a gravity feed or a pump. The colder water at the bottom of the storage tank then travels into the collector and starts to heat up. This process is a continuous cycle and can save the average household up to 70% of their hot water energy requirements and related greenhouse gas emissions. A solar split system consist of north east to north west facing roof mounted collector(s) and a separate tank on the ground, usually located close to one of the major hot water consumption areas, such as the bathroom. The sun heats the water in the collector and once the water reaches a desired temperature, a sensor device activates a circulation pump which starts to pump the hot water into the storage tank on the ground. The pump also pumps the cold water from the bottom of the storage tank into the collector(s). How does the roof mounted and split systems compare? The energy benefits of the two systems are about the same. While the heat loss is less in the split system as the tank is not as exposed to the elements as the roof mounted tank, some additional energy is required to operate the low wattage pump in the split system. The decision of which system to use comes back to structural design of the roof, personal taste and ease of access for servicing. Whether you are looking to fix a leaking toilet, clear a blocked drain, repair a leaking tap, need 24 hour emergency service or just some general plumbing repairs, Flo-Rite Plumbing guarantee our friendly and courteous plumbers are committed to fixing your plumbing and hot water problems every time.